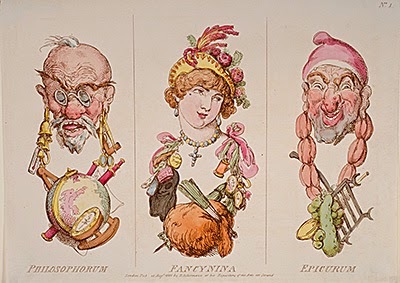 In 1800, Rudolph Ackermann, the great print publisher, issued Masqueronians, a suite of six hand-colored emblematic etched plates by the great caricaturist, Thomas Rowlandson, each with three figures representing various English "types," for a total of eighteen. The species include an undertaker; barber; flower girl; lawyer; soldier; fish-monger; street vendor; doctor; nun; pub owner; fashionable lady; philosopher; fox hunter; writer, and etc. Only one copy has been seen at auction since 1922: "An excessively rare Rowlandson item, only one other copy being known" (Anderson Galleries sale, 1922). 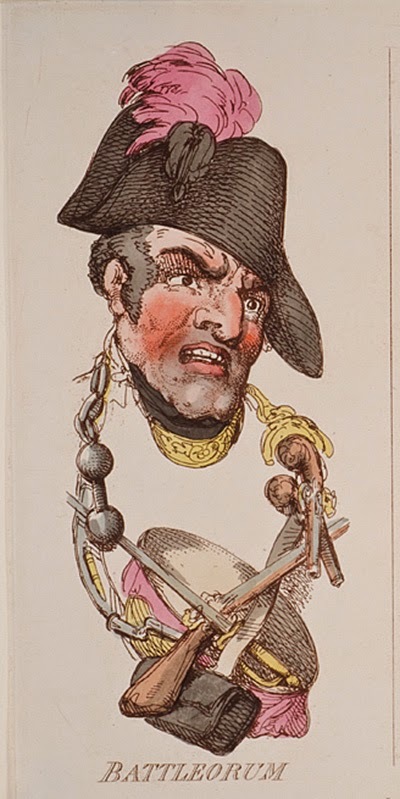 Color-plate books depicting itinerant tradesmen and/or occupations were nothing new in 1800, when Masqueronians was published. Cries of London - "cries" being the street language of vendors hawking their wares in the squares and markets of 17th-century London - was published by John Overton in London 1680-1700. Between 1792 and 1795 Francis Wheatley exhibited a series of oil paintings entitled the “Cries of London.” It was a popular subject. 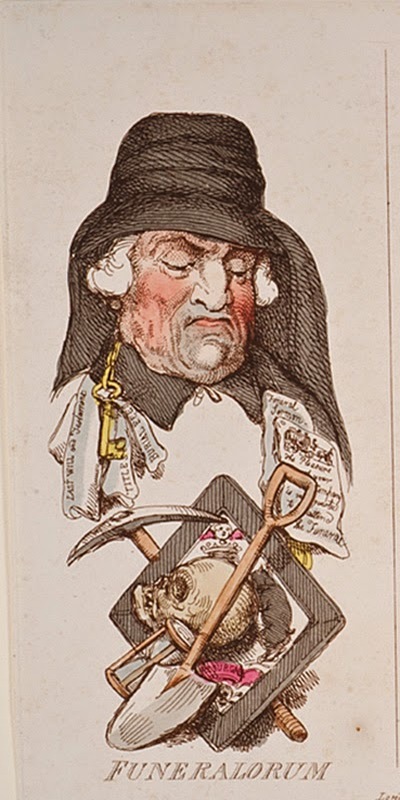 But it was up to Rowlandson to treat the subject emblematically as social satire, the wares or tools of the trade worn as garlands. His aim included a caustic arrow to the faces he associated with each occupation. 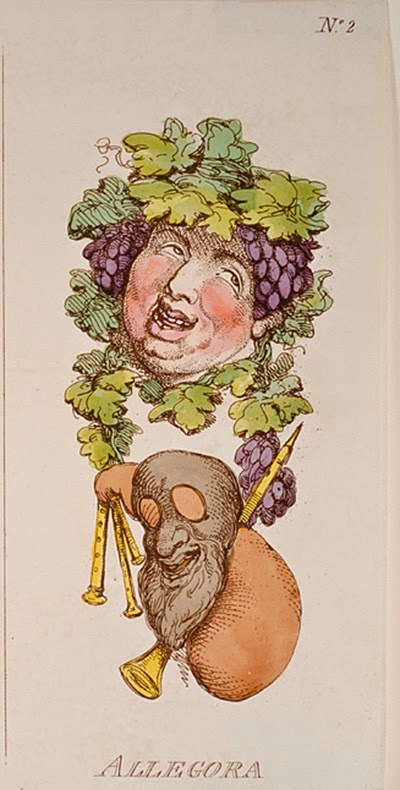 The street vendor above ("Trafficorum"), for example, is depicted with a hooked nose and it doesn't require a Ph.D. to understand that Rowlandson is skewering Jews. Rowlandson impales physicians as sour-pusses impaling patients with their main instrument of practice, a clyster syringe, the better to drain der keister of all that ails ye. Don't get him started on nuns and the proprietors of pubs. We will gloss-over the fashionable lady in her finest frou-frou: the philosopher appears to be annoyed to be matched with her; inquiring into the mystery of life is his trade but the mystery of women remains a mystery to him, as it was to whom appears to be his descendant, Freud. Actors and fox-hunters beware: Rowlandson has your number. And writers? The pen may be mightier than the sword but strangled by vipers, as Penserosa seems to be, the sword might be the best way out when critics spew venom, quills being notoriously undependable instruments of suicide. ROWLANDSON, Thomas. Masqueronians. London: R. Ackermann, 1800. Folio (275 x 375 mm). Six hand-colored etchings, each with three emblematic portraits, all printed in brown ink. The Shocking Hard-Boiled World Of Librarians!